I love to cook dinner for my husband, but I'm always trying to strike that balance between keeping it economical (otherwise, why not just order in? ), keeping it healthy, and keeping it interesting. But in the two and a half years that we've been married, I have started to feel like I'm running low on options: We both try to limit the red meat we eat, fish gets expensive (and smelly), and I've cooked so much chicken, it's a wonder we both haven't sprouted feathers. But the other day in the grocery store's frozen section, I stumbled upon a brand new idea that really has legs: bags of frozen shrimp. Don't ever waste your money on the "fresh" shrimp at the seafood counter- as a matter of practice, all shrimp are flash frozen, (they have just pre-thawed them) so this is one case in which buying frozen is the right move. A bag of frozen shrimp is about $10-15 at the store, which may seem pricey, but there are enough shrimp in there for 4 to 5 meals for two (taking you down to, like, $3/meal). And since you can cook the shrimp from frozen, you can quickly and easily just grab the amount of shrimp you want, reseal the bag, and put the rest back in the freezer. There are at least a hundred delicious meals you can make with your shrimp (not to mention my favorite old-school appetizer of all time, shrimp cocktail). Here are just a few of the dinners I have gotten out of one bag of shrimp, but this versatile and delicious crustacean goes well on just about anything- the sky's the limit. Or maybe the bottom of the ocean is the limit. Whatever. 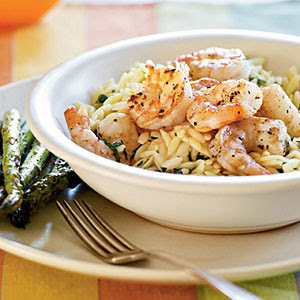 Shrimp Scampi: Quickly boil and peel your shrimp, then saute them with butter, minced garlic, lemon juice and white wine. Serve over pasta or rice, and top with Parmesan cheese. Shrimp Tacos: Boil and peel shrimp according to package directions. Serve in warm tortillas with cheese, black beans, shredded cabbage, and pineapple salsa. Shrimp Cobb Salad: Cook shrimp according to package. Serve on top of greens with hard-boiled eggs, avocado, tomato, blue cheese and bacon (if you like). Top with vinaigrette. Shrimp Rolls: Boil and peel the shrimp, and then run under cold water until cooled. Cut up the shrimp to small pieces, and combine with minced red onion, celery, parsley and mayonnaise. Serve on toasted and buttered hot dog buns. Uh-oh, I think I might be growing an exoskeleton. I love shrimp as well! In fact, I'm eating some frozen shrimp (well, cooked now!) for lunch. i love having frozen shrimp in the freezer and always make sure all the only ingredients are shrimp and salt. had some with polenta last night. Is it important where the shrimp originates? I have been told that a lot of shrimp we eat in America is actually from muddy, fecally waters in Thailand. Is this true? Where is the purest place for frozen shrimp to originate? Excellent point, anonymous (and very impressive use of the word "fecally"). I don't actually know that much about this topic, although I make a point to purchase organic. I'll look into it!